I’ve eaten so much local and/or small batch ice cream in the past few years that I have started to consider myself something of an expert in the field. When Donny pointed out to me that we had been offered a free sample of Graeter’s ice cream, from Ohio, I was intrigued. Here was an opportunity to expand my field of knowledge to the Midwest. We were being offered the ice cream to let people know that Graeter’s is now available in the NYC area, at both D’Agostinos and Stop & Shop stores. 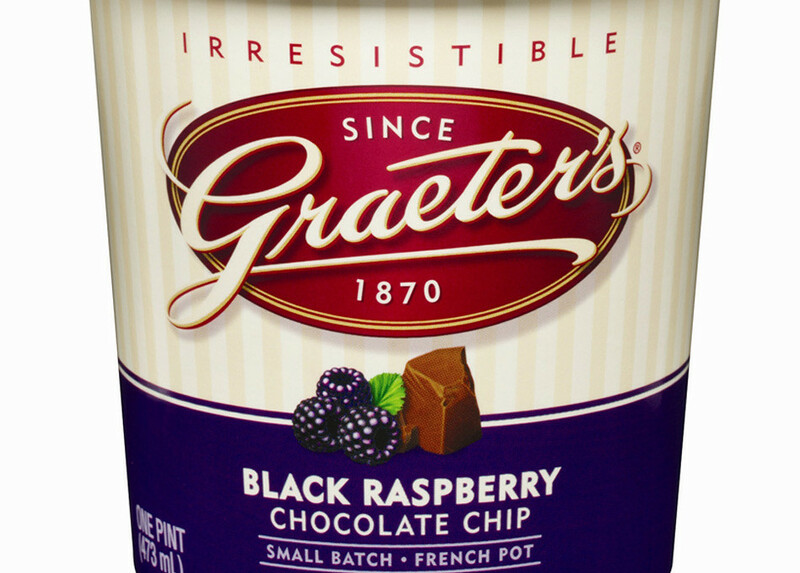 The PR email let us know that Graeter’s is a favorite of such luminaries as Oprah, Dr. Oz, Sarah Jessica Parker, George Clooney, Emeril Lagasse and Bobby Flay. More important to us, it’s the childhood favorite of our friend Scott, who grew up in Ohio. When he found out that we were getting some free Graeter’s he got as giddy as a schoolgirl. I was sent samples of four different flavors: Black Raspberry Chocolate Chip, Chocolate Chocolate Chip, Mint Chocolate Chip, and Buckeye Blitz. I ended up eating almost all of it myself, but I saved the Black Raspberry for Scott, since that seemed to be the one he was most excited about. After the jump, you’ll find my impressions, along with Scott’s thoughts. One of Graeter’s signature additions is their chocolate chips. As Scott explained it, they melt the chocolate on the inside of a large kettle, let it solidify, and then break the solidified chocolate into uneven pieces. In fact, the pieces of chocolate range from tiny specks to large chunks, and Scott told me that when he was younger they used to have friendly competitions to see who could find the largest chunk of chocolate in their ice cream. It was indeed fun finding different sizes of chocolate chunks in the ice cream, but I was disappointed with the texture of the chocolate itself — it seemed a bit waxy and chewy. As far as the flavors of the ice cream itself, my two favorites were the Chocolate Chocolate Chip and the Black Raspberry Chocolate Chip. The chocolate base tasted like a frosty glass of ice cold chocolate milk, which was actually very refreshing. So when I wrote to Scott that we had gotten a pint of the Black Raspberry Chocolate Chip, he wrote back almost immediately, “You just won the ice cream lottery!” This was one of his favorites as a kid. The ice cream was not as sweet as the other flavors, and lacked any of the artificial “berry” flavor I was expecting. Since every pint is hand-packed, Scott said, each pint is slightly different. I don’t think it will replace any of my local favorite, but it was quite good. Every time Scott’s family gets together, they get a bunch of Graeter’s ice cream. If they are gathering somewhere outside of Ohio, they usually pay to have Graeter’s shipped to wherever they will be. The ice cream clearly evokes childhood memories in everyone who ate it growing up, and there’s something kind of old-fashioned about that. Imagine the way you used to love, I mean really love ice cream when you were a kid. If you could re-experience that today, wouldn’t you? Although Graeter’s doesn’t do that for me, it’s nice to know that there are some people out there it is still able to touch.